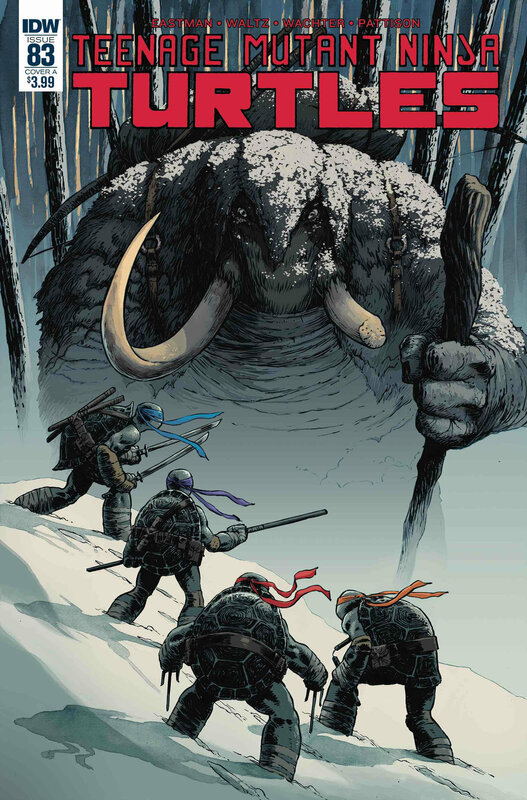 THE ISSUE: In their quest to defeat the Rat King, the Turtles find themselves in Siberia. Once there, they face his brother, the gigantic Manmoth. WHY IT’S EPIC: Dave Watcher has had the cover duties on Teenage Mutant Ninja Turtles for the last few months, and he’s been absolutely killing it. His depictions of the TMNT-style human/animal hybrid characters are striking. The texture that Watcher gives to these creatures makes them feel very familiar, despite their otherworldly nature. For another such instance, check out the cover to TMNT #82, where he gets to draw the Toad Baron. But TMNT #83 is definitely a highlight of Watcher’s work on the series. What’s interesting about this one is that despite Manmoth leering over our heroes, much of his body is still shrouded in shadow. He’s not in the shadows, per se. We can clearly see the snow on top of him. But the lighting has that effect because he’s almost in a hunched position. I also love that you have to look closely at the cover to see those menacing eyes. The Turtles look great too, of course. On my first read-through, Manmoth felt very familiar. Not in that I’d seen him before, but because a mutant mammoth seemed like such an obvious course for the TMNT universe, I was convinced Kevin Eastman and Peter Laird had created him at some point. As it turned out, the character originated over at Archie Comics. First in 1991’s TMNT Meet Archie #1, and later in the pages of TMNT Adventures. To their credit, the crew at IDW really is drawing inspiration from all corners of TMNT history. They made a silly one-off character from the ’90s into something pretty damn cool. This entry was posted in Comic Books/Graphic Novels, Epic Covers and tagged Archie Comics, Bobby Curnow, comic book reviews, comic books, Dave Watcher, Donatello (TMNT), Epic Covers, IDW Publishing, Kevin Eastman, Leonardo (TMNT), Manmouth (TMNT), Michelangelo (TMNT), Ninja Turtles, Raphael (TMNT), Rob Siebert, Teenage Mutant Ninja Turtles, Teenage Mutant Ninja Turtles #83 (2018), Teenage Mutant Ninja Turtles (IDW), TMNT, TMNT Adventures (Archie), TMNT Meet Archie, TMNT Meet Archie #1 (1991), Tom Waltz on 06/24/2018 by primaryignition.